Start with the large bowl, two cups of cold water and two cups of flour. Pour the two cups of cold water into the large bowl. Gradually add flour and stir constantly until the flour is fully incorporated and totally smooth. Divide the flour mixture into the muffin tins (or small bowls). Add a few drops of food coloring to each muffin tin. Stir each mixture, adding more food coloring if needed, until you achieve the colors you want. Encourage your little one to get messy and have fun creating original works of art! Try these tips to help her overcome the typical barriers girls face. We all know there is a gender gap in STEM. Women hold about 24 percent of STEM field jobs in the United States, and when you get into the leadership ranks the numbers are paltry. Even in the movies, only 12.5 percent of characters with STEM careers are female. Luckily, many groups—including my own, VentureLab—are working hard to engage girls in both STEM and leadership. Here are 10 ways you can get involved at home to empower your daughter to be a leader in STEM. 1. Encourage curiosity and experimentation. Encourage your daughter to ask Why, How and What if…? If she asks a question like “how do clouds make thunder?,” go online with her to find the answer and the science behind it. Check out YouTube and find some easy to do at-home science experiments, like making slime out of various household materials. Even cooking together and trying different ingredients is a good way to experiment. A curious mind will not be afraid of trying new things and will not be afraid of asking questions that might lead to new innovations. Take on the mentality of a maker. Instead of buying something or waiting for someone to solve a problem, do it yourself. You can set up a mini maker space or crafting table in your house dedicated to creativity and messiness. Create a space where girls can explore their hobbies, experiment, and create. A maker’s space doesn’t need to be expensive. Use recycled cardboard, Styrofoam, yarn, art supplies, and any kid-friendly tools lying around your house. Girls who make things will learn to find resourceful ways of solving problems and will become doers and leaders. 3. Encourage a growth mindset. Compliment girls’ efforts, not their intelligence. A growth mindset means that our brains can change and grow: we learn new things by practicing. When girls hear things like “You are so smart” they tend to believe that being smart is innate and not changeable. So, when they receive a not-so-great grade they believe they have failed. Instead, compliment girls’ efforts by saying “You worked really hard” or “I’m so proud. You didn’t give up on that math homework.” By complimenting girls’ efforts, we are priming them to do hard work and remain persistent despite challenges. Redefine what she thinks of as failure. Help girls learn that everyone fails. It’s how you deal with failure that makes all the difference. When something doesn’t go according to plan, emphasize that failure is a part of the learning process! Failure is about testing hypotheses and practicing until you have mastered a skill. Give examples of times that things haven’t gone as well as you expected them to. If they are struggling because they are being challenged, that’s because they are trying something new! 5. Put her in front of people and ask for what she wants. Help girls develop a more powerful presence by teaching them how to interact with adults and others. At home, practice with girls and show them how to introduce themselves, shake hands firmly, and make eye contact. At restaurants, have your daughter order for herself. The ability to confidently introduce herself and ask for what she wants will set her apart from the rest and serve her well later in her career. 6. Encourage her ideas and focus on her strengths. In general kids are used to not having their ideas heard, so go ahead and encourage girls’ ideas no matter how silly or impractical they sound. Have her write her ideas down in an Idea Journal and get involved in the process if she is interested in pursuing a project. Even if her idea doesn’t work, she’ll know that she has your support and will keep trying new things. And if you see that your girl has strengths in math, science, art, or whatever it might be, encourage her to pursue those areas and sign up for classes or camps that will hone her skills. A little bit of encouragement goes a long way for girls and will set them up for success. Sometimes it’s hard to picture yourself doing something until you see someone like yourself doing it. This can be particularly challenging in the STEM fields. Reach out to local women scientists and engineers and ask if they will speak to your daughter about their field of work and their experiences. If you don’t know any women scientists or engineers, check out FabFems.org for female STEM role models. And you can always study women role models from the past and present, like Mae Jamison, the first African American woman astronaut, or Mary Barra, engineer and CEO of General Motors. Such models help inspire girls and show them that they too can pursue STEM fields. 8. Solve meaningful problems around you. Girls become more engaged in STEM when they see how it can be applied to helping people and the planet. Help girls link math and science to real-world problems. Support her and get involved, whether she wants to help build houses for Habitat for Humanity or just build a birdhouse. Show her how engineering and math is involved. Or maybe she is interested in the environment and sustainability and wants to build a hydroponics unit. Discuss the science behind hydroponics and plant growth. We tend to take kid’s play for granted, but so much learning, experimentation, and creativity comes from play. With play there is no judgement, no fear of failure, and often no right or wrong answers. Yes, some games have winners and losers, but it is part of teaching rules and strategy. Expose girls to tech toys, like Ozobots or Dash and Dot, to learn about coding. Play with Snap Circuits or littleBits to create all sorts of electronic inventions. Build with Legos and toys that use the imagination. Even cardboard boxes are great to play with and turn into forts, or she can create her own games out of recycled cardboard. Learning through play is a great way to internalize important concepts and stimulates the whole brain. 10. Watch unconscious bias and gender learning differences. Even if STEM isn’t your forte, be mindful of how you speak about it. If they hear, “We’re just not math people” or “Science is hard,” kids pick up on these cues. Approach STEM with a curious mindset and learn with your daughter. As parents, we may also unconsciously steer our daughters away from adventure and experimentation. We tell boys to go climb trees, but we tell our girls not to get their dresses dirty. These messages affect the way girls see themselves and what they should and should not be doing. Help empower girls to enjoy STEM and be adventurous risk-takers. This article was written by Cristal Glangchai Ph.D. from Working Mother and was legally licensed through the NewsCred publisher network. Please direct all licensing questions to legal@newscred.com. Bill Nye, the ‘90s television icon, the teacher who helped kid-me understand topics like buoyancy and momentum, the man whose mission it is to help make science more accessible to the masses, is back. (Not that he ever left—he’s always been really, really busy.) These days, Nye is teaming up with Nintendo to help promote the just-released Nintendo Labo and is getting ready for the premiere of the third season of his Netflix show, Bill Nye Saves the World. 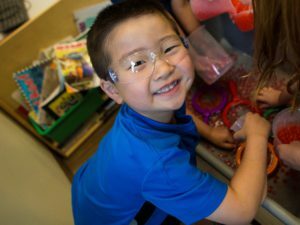 At a time when science instruction time is quickly declining in elementary schools, I asked our favorite Science Guy what parents can do to get kids excited about the subject he loves most. “There’s always concern expressed about video games,” Nye says. “These kids today … When I was young, doggone it … Look, the video game is going to be in your household.” Believing that video games can help kids get excited about STEM, has teamed up with Nintendo to promote the Labo, a series of DIY cardboard kits for the Nintendo Switch. It ingeniously melds gaming with making—the screen guides kids as they build real toys they can play with, from a fishing rod to a piano to a robot suit. “It is inherently hands-on,” Nye says. To help kids learn and gain confidence, sometimes moms and dads need to get out of the way. You can make music with just about anything found in your household. Adding a musically inclined environment to your child’s life offers extensive benefits for her emotional, intellectual and social development. For young children, music helps identify teamwork. It shows that you can create something greater with the help of more people. For example, the use of drums, guitars and vocals can produce a better song than a song only containing the use of drums. Music allows children to express themselves through creativity and openness with others. 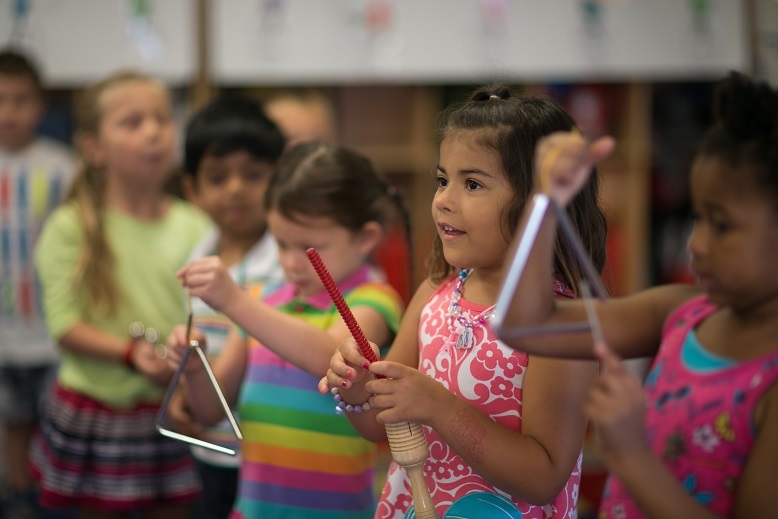 Enjoying music gives preschoolers a common interest and can create lasting friendships. Here are some ideas to incorporate some tunes into your child’s daily activities. Allow your child to sit at the kitchen table with pots and pans to use as drums while you make dinner. This engages your child with you in the kitchen and keeps him away from the possible dangers of the kitchen while you are cooking. Provide him with different types of pans and utensils (for example, plastic utensils and metal pans) so that he can learn to create various sounds. It is best not to use glass in this activity. Sing along with your child in the car. Preschoolers are not yet at the age where they become self-conscious of their behavior. In fact, most little ones love letting out their strong vocal chords for everyone around them to hear. Encourage your child to do this more often, even if it is a little loud on the ear drums! Playing basic songs and repeating them regularly will help your child retain simple melodies and rhythms. Plan a dance party for family fun night. Encourage your child to get up and show you his moves by playing freeze dance. This is done by a family member controlling the music and stopping it at random times. When the music is stopped, everyone freezes until the song restarts. Freeze dance always results in tons of giggles by all the family members.